I’m late. They are going to start the meeting without me. This one is important. I don’t exactly know why, but Rachel has made that clear to me that it is, and I’ve learned to trust her implicitly when it comes to administrative matters regarding Nate. I spend my days leading a team decisively, but I am like a ship in the night in these situations, and Rachel is my beacon. Today, though, it would be her that was shaken. Traffic has finally relented, and I’m pulling into the school parking lot now. At least, I am trying to. There is a strong crosscurrent of parents and children leaving as I try to find a path in. Nate’s bus has left, and he’s already gone. I spend my days leading a team decisively, but I am like a ship in the night in these situations, and Rachel is my beacon. I pause for a moment and reflect on how remarkable it is that he rides that bus to and from school every day without any more supervision than his typically developing peers. It took courage to ride the bus when I was growing up, and I was able to speak up for myself. Our friend Teresa will be there to pick him up when he arrives, so that Rachel and I can focus completely on this meeting. Car parked, I quickly stride into the school lobby and frantically try to text Rachel to find out where they are meeting. Someone points me in the right direction, and as I enter the room, it is clear that I was not the only person caught in traffic. Thankfully, I did not miss anything. Settling into my seat, it feels like I have been called to the principal’s office. These are the rooms you never wanted to see as a kid. The faces surrounding the table are warm and friendly, helping to dissipate the latent anxiety and remind me that we are not here to talk about me. We are here to talk about Nate. I’m still not exactly sure what the meeting is for. I know what an IEP meeting is, and this is not one. Rachel had said it was a three-year something or other, and I know there were some test scores. My wife is a marvelous partner in these moments. Well, in all moments, but especially these. 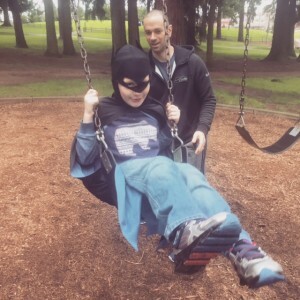 Our son’s disability has sparked a passion in her to learn about special needs advocacy. Few parents know as much about what resources are available, or what rights they and their children have, as Rachel does. As prepared and educated as she is, I know these meetings weigh heavily on her. Finally, we are about to begin. The school psychologist runs through the agenda and we do a round of introductions. A large stack of paper is dropped in front of each of us. It is like a Nate novella. Probably 40 pages deep, printed on both sides, it contains the results of a series of evaluations done on Nate, ranging from fine motor skills to speech. One by one, the specialists read through their sections. A large stack of paper is dropped in front of each of us. It is like a Nate novella. Gross motor goes first. Nearly a half-hour goes by as we hear about how high Nate can jump, how well he can traverse a staircase, and whether he has his Dad’s knack for catching a ball. The process continues a half-dozen times as each specialist gives their report. They all love Nate. They all are committed to making his life as full as possible. We are incredibly fortunate to have them. Finally, we reach a point where the school psychologist tells us that, after years of repeated failed attempts, they are excited to say they were able to successfully administer an IQ test for Nate. Here is where Rachel and I differ. 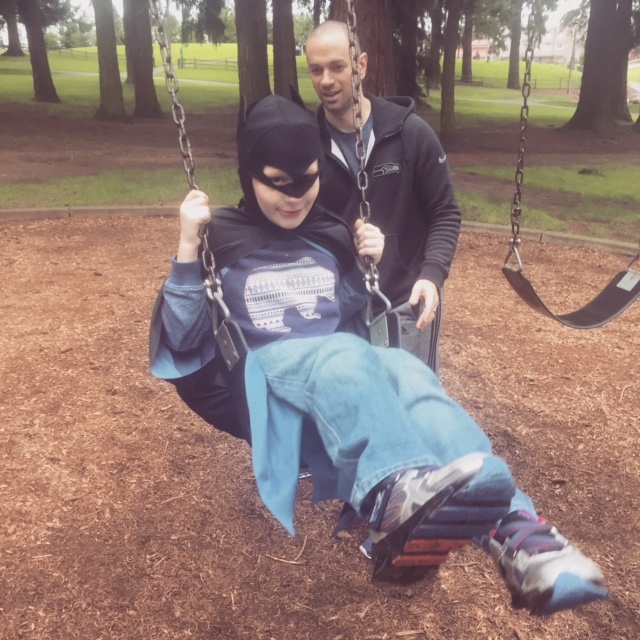 When you have a child with developmental delays that are not likely to resolve, you become accustomed to long meetings where people tell you all the things your kid is unable to do. The relentless beating of the drum wears Rachel down. She often needs a couple of days to recover after these meetings. I have spent years honing the ability to focus on the things I believe matter and ignoring the rest. It started long before Nate was born. Our older son had difficulty with language when he was around two-years-old. We took him to Children’s Hospital, where they ran a series of tests. We anxiously awaited the results. When we sat in the office of the pediatric speech specialist, and she told us our son had apraxia—and that he may never learn how to speak—Rachel and I were devastated. We went home and cried together for hours. We researched, and asked for more details. It was all we could think about. We took a class for parents of kids with speech problems. It was there that I learned the valuable lesson to focus on the symptoms and not the diagnosis or test score. Is your child having trouble speaking? Get him or her help with that. Is your child having trouble eating? Get some help for that. Perseverating on the diagnosis or score can often get in the way of dealing with the child you have right in front of you, the one you know better than anyone else. There is no salvation in dwelling on what may be, only in dealing with what is. My anxiety and fear faded as I employed this tactic. I knew we were giving our son what he needed. The lesson only grew stronger when our son was talking perfectly just a year or two after the diagnosis. He is turning 15 soon, and English is his strongest class, writing his most precocious skill. The fact that the diagnosis was wrong, and knowing how much energy we wasted fretting, left me with an emotional callous that serves me well to this day. Perseverating on the diagnosis or score can often get in the way of dealing with the child you have right in front of you, the one you know better than anyone else. Back in the room, the IQ scores are about to be read. Before the school psychologist says a word, I have already decided this is more for his benefit and the school district’s benefit than mine or Nate’s. No matter what the number is, it will be just be a number. A number that was arrived at based on imperfect tests of a kid who notoriously does what he wants, when he wants. Don’t worry. I’m not a parent in denial. I know Nate has limits. So do I. So do you. I also know that there is not a single number in the world that would define his potential. So when the psychologist reads some low scores for Nate and tells us that he will never live independently, I check my phone to see what time it is. He might as well have been reading the attendance list from first period. Of all the scores in the world, IQ might be the least relevant for Nate. I accepted a long time ago that his path would not be about academic achievement. Knowledge is often too narrowly defined as what can be graded in a classroom. Think about the kids you knew who were in advanced school programs. How many of them grew up to run their own businesses, command respect as leaders, or be truly happy? Nate already has knowledge that many of those kids will never have. He knows how to make people laugh. He knows how to make total strangers fall in love with a kid they just met. He knows when someone is sad, and how to soothe them. He knows how to infuriate and endear in the exact same moment. I don’t even know how to do that. Nate is growing and learning. He says more words, and in longer sentences, than he ever has before. He can read a little. He can plant seeds, and he loves to watch them grow. We read The Big Book of Why every night, and he is captivated by all the “whys” of the world. I am captivated by him. I am no more able to predict his future at 11-years-old than my parents were when I was that age, getting my own collection of poor grades. He may never live independently, but his life is already full of independence. Just ask the bus driver. I don’t blame the psychologist for trying to perform the test or sharing the results and his conclusions. He was doing his job and meant well. It has been a few weeks since the meeting ended, and I can’t tell you much about what else happened in there. Not because I don’t want to, but because it’s already left my mind. Nowhere in those dozens of pages of results did it tell me how to be Nate’s parent. That is because there is no manual. Humans have been having children since the dawn of time and we still have nothing close to instructions for how to be a parent. Some kids need tough love. Others need patience and freedom. No test is going to light the path. You have to walk it yourself.